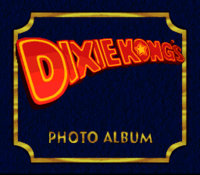 Dixie Kong's Photo Album is a photo album found before the staff credits of Donkey Kong Country 3: Dixie Kong's Double Trouble! The album separates the characters of the game into several groups based on their appearance, abilities, and disposition; this makes it similar to the cast rolls in Donkey Kong Country and Donkey Kong Country 2. This group includes the Kremling remnants that served under the rule of KAOS during the events of Donkey Kong Country 3. The Kremlings Kreeps are part of the newly restored Kremling Krew and were Baron K. Roolenstein's new soldiers. They are Donkey Kong Country 3's equivalent of "The Kremlings" from Donkey Kong Country and the "Kremling Kuthroats" from Donkey Kong Country 2. This group consists of every land-dwelling enemy. Kremlings are not included in this category, because they have their own class. This group is the equivalent of "The Bad Guys" from Donkey Kong Country and the "Lazy Landlubbers" from Donkey Kong Country 2. "Terrorfirma" is a pun on "terror" and "terra firma" (solid ground); "tuff" is a misspelled variation of "tough". Knik-Knaks are included in this enemy class, even though they are mostly airborne. However, a few of them walk on land. This group includes all winged, flying baddies, except Knik-Knaks and Lemguins who belong to the "Terrorfirma Tuff Guys" category. It is the smallest enemy class, with only four members. This group includes all underwater baddies that can be found in coral levels such as Bazza's Blockade. It is Donkey Kong Country 3's equivalent of "The Aquatic Bad Guys" from Donkey Kong Country and the "Submerged Seadogs" from Donkey Kong Country 2. This group has all of the bosses from Donkey Kong Country 3. This section is equivalent to "The Bosses" from Donkey Kong Country and the "Barnacled Bosses" from Donkey Kong Country 2. The class contains all of the Animal Buddies from Donkey Kong Country 3. This section is equivalent to "The Good Guys" in Donkey Kong Country and the "Animal Buddies" section in Donkey Kong Country 2: Diddy's Kong Quest. This group contains the Brothers Bear, a family of friendly bears who help the Kongs in their journey by trading items with them. This group features all of the Kongs who appear in Donkey Kong Country 3, with the exception of Donkey Kong and Diddy Kong. This section is equivalent to "The Kongs" from Donkey Kong Country and the "Kong Klan" group from Donkey Kong Country 2: Diddy's Kong Quest. This page was last edited on April 9, 2019, at 16:52.